The topic on which Gretchen Rubin focuses in her July chapter is one that can lead to avoidance or uncomfortable discussions: Money. She manages to tackle the old “money can’t buy happiness” cliche, pointing out that, like good health, we don’t think about money as long as we have it. When we don’t, it’s hard to think of anything else. She also deals with the relative nature of wealth. For me some of the most useful discussion on the book is the concept of the “modest splurge.” I think we all tend to strain at a gnat and swallow a camel. We tackle the big expenses, but then we go cheap on little things that can give pleasure. Her example–buying a nice pen that gives pleasure when writing–is a perfect example. I also appreciate the point she makes that “even a modest pleasure can be a luxury if it’s scarce enough.” If we don’t give in to every whim, a small splurge can feel like a luxury. She also brings up another area of which I’ve been more aware, the idea of saving little luxuries for special occasions. All too often, I find I end up wasting the very things I was saving. I’ve had “special” candles that melted into puddles before I ever lit them.When I moved, I found some “special” jars of sauces and condiments that had passed their “use by” date. I don’t know what I was waiting for. 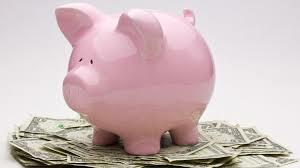 I’ll confess that I don’t even like to think much about money matters. (That may explain why I abandoned my accounting degree and went back to school to teach English.) This month, though, I’m enjoying the light touch Rubin gives to a topic that has such a big effect on our happiness and especially on our relationships. It’s July, but I need to add a postscript to June’s chapter on friendship. In the chapter, Gretchen Rubin makes some great suggestions about making friends: Smile more frequently, invite others into conversation, create a positive mood, and more (pages 158-9). In the last week or so, after months of making new friends after our move, I’ve had time to reconnect with old friends. I went back to North Carolina for the annual girlfriend beach trip. Before I left, as I read through the guest book we’ve been signing for 16 years, I was reminded of those little details in life that make the most fun, the most laughter. I’ve spent the last couple of days at Summer Celebration, a conference on the campus of Lipscomb University, where I attended college forty years ago. I’ve seen so many old friends, former professors, even the lady who worked in the registrar’s office (the problem solver). To add to the fun, four car loads of friends from the church we attended in Hickory were there too. It has felt like Old Home Week, reminding me that maintaining those long-time friendships is worth the effort–without question. I didn’t need to read the research supporting the value of “strong social bonds” and interpersonal relationships in Chapter 6 of Gretchen Rubin’s The Happiness Project to be convinced of the value of friendships. I was pleasantly surprised, though, by studies that show that strong relationships not only lengthen life but that they are more effective than quitting smoking. I’ve long known that anything potentially unpleasant is more bearable with company, and anything that is fun to do becomes more so with friends. I can walk farther when I’m not walking alone. Music or a good audiobook piped through my earbuds can make exercise time go by faster, but I know from all those years I regularly walked and worked out with my friend Claudia how time spent with a friend manages to take my mind off my knees or feet or hips (or lungs). Oh, the stories we’ve shared and the kids we’ve raised on our old five-mile treks. In the first part of the chapter, in order to reconnect with old friends, strengthen new relationships, and to maintain close ties, Rubin decides to remember birthdays. She tediously updates her address book and her calendar in order to send birthday emails. When a friend suggests she call instead, she takes refuge in Voltaire’s advice: “Don’t let the perfect be the enemy of the good.” She knows she won’t make those phone calls but she will email. For some people, phone calls are easier. Other people have a genuine gift for handwritten notes. Even with Facebook birthday reminders, I try to be more personal. I also suggest that if you have your account set to send automatic birthday greetings to your Facebook friends that you change that setting. Recently, I was dismayed to see numerous birthday wishes to a cousin-in-law who had died earlier this year. Honestly, I don’t care to get a birthday greeting from someone who didn’t actually send it, do you? There are so many ways to keep up with people these days, even though most school alumnae records are private and almost no one has a landline, rendering the white pages of the phone book basically useless. 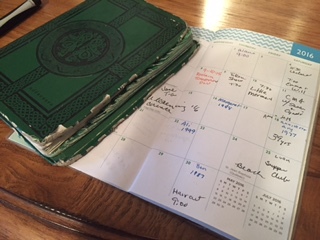 I still maintain an actual address book (see picture above) and paper calendar (one in my purse and one on the laundry room wall.) Not only do they help me to keep up, but they are great artifacts when I finish up my scrapbooks of each year. Each time I feel the need for a new address book, I go through the ritual of copying the names and the current addresses, amazed at all the changes in just a few years’ time. I’ve always been a big sender of Christmas cards, but I know some people who wait until January and send New Year’s cards. This has two benefits: They don’t get lost in the shuffle and you have recent contact information of people who sent you Christmas cards, avoiding unintentional omissions. May has flown, and there’s so much in the chapter this month that I could just park here awhile–but I won’t! In today’s post, I first want to draw attention to the three categories of fun that Rubin identifies: 1. challenging fun, 2. accommodating fun, and 3. relaxing fun. Preparing to run a 5K with a friend would be challenging. Taking the kids to Disney World would be a form of accommodating fun (though I bristle to identify it as fun at all!). Soaking in the hot tub would be relaxing fun. For now, I’ll admit that seeking forms of play has never been a challenge for me; making choices among all the possibilities has been. I will testify, though, that adding play to one’s life is enriching far beyond the effort required. That’s why I’ll keep playing music, going to author readings (with friends), meeting Traci for early Saturday morning run/walks, and helping the grandkids find every blanket in the house for their tent city in our den. Having just said goodbye to Sandy and Frank, our Memorial Weekend house guests, I’ve born witness to how play keeps people young. I’m curious to know how others’ choices of fun sort out. Which of these choices have enriched your life most? In her case, she is referring specifically to her “kid lit” reading group, but I’ve found the same to be true in my overlapping circles. Moving to a new city at this point in our lives could have been daunting. We had (have) great friends back in North Carolina. While we moved to Nashville to be close to family (read: grandchildren), I also knew we needed a bigger circle. I have stayed in touch with my college roommate for decades. Yes, decades. She even looked after my daughter during her college years. As soon as she heard we might move to town, she had us lined up to join her supper club. Within days of moving in, we had dinner with her and her husband and another couple. The other friend invited me to her book club. New circle of friends. I invited them to a library reading. They invited other friends. Meanwhile, another friend I met at my music camp five years ago moved to town about a week after I did. She’s helped me to find music circles, but we’ve also branched out to attend other literary events–and culinary experiences. Tonight I attended a dinner at which I was the only woman who didn’t play tennis. I found myself thinking, “Well, maybe I could learn….” Then I found that one of my new acquaintances plays guitar and sings. Before long the whole kitchen was filled with harmony. I’m not sure how to measure, but I suspect my life satisfaction increased by at least two percent. It may say more about me than anything else, that I find so much to think about and write about in Gretchen Rubin’s May chapter “Be Serious about Play.” Today I’m taking look at her particular source of fun: children’s literature. Just the mention of book titles in this chapter rang all kinds of bells for me. I have been a fan of young adult (YA) lit since the genre was identified. Some trace its beginning to S.E. Hinton’s The Outsiders, even though plenty of books written before that one could fit into the category better than children’s lit. In the years I’ve attended the annual convention of the National Council of Teachers of English (NCTE), I not only found myself introduced to many great works of YA lit, but to the authors as well–S.E. Hinton, Robert Cormier, Paul Danziger, Paul Zindel, Lois Lowry, and so many more. Rubin’s explanation of the difference between children’s literature and adult literature, not merely a superficial difference, makes sense to me: these books deal with universal themes, particularly good versus evil. They deal with real human conflicts, social justice, life and death, fate and free will. No set of books exemplifies this point better than J.K. Rowling’ Harry Potter series. I know some adults who steered clear of these books because they were children’s books or because they had garnered so much hype that these readers thought there must be some trick. I have to take a note from the chapter in which she points out that we have “plenty of time to have fun!” My first reaction to this chapter is a desire to re-read some of my old favorites, especially now that I know right where to find them, having unpacked those boxes and given them a place of their own in the rooms we have furnished for our grandchildren’s visits. While I have so many other books on the figurative pile on the nightstand (temporarily displaced as we’re having the bedroom floors finished), I may have to venture back through Little Women, The Witch of Blackbird Pond, Charlotte’s Web, Where the Red Fern Grows. If I get industrious, maybe my grandchildren and I can read through the Little House series together, which my fourth grade teacher read in its entirety, a few minutes a day after lunch.